Richard Green also provides a Monumental Masonry service. This means that any type of memorial can be provided, from traditional churchyard headstones to ornate obelisks and memorial tablets. All of the stones are obtained in blank form to order and inscribed by machine or hand-carved as required. In addition to providing new memorials (regardless of whether Richard Green Funeral Services arranged the funeral), a full repair, additional inscription and cleaning service is available for all memorials. We would be pleased to inspect any memorial in our area free of charge and provide you with a full report including the cost of any works. It is also possible to purchase items such as replacement flower vases for existing memorials. 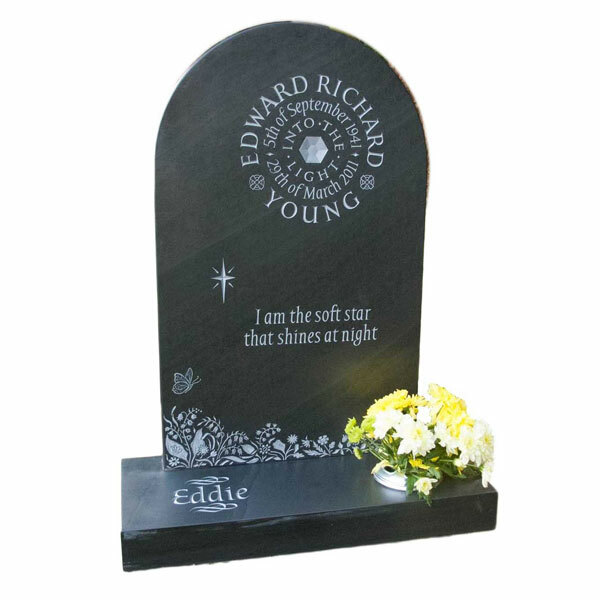 A range of memorial sample stones are available at both offices to enable you to compare the various finishes. Alternatively you can see the different types of stone and the various memorial designs here and here. Please note that there are restrictions on the type of memorials allowed in churchyards and some cemeteries, and we will be happy to advise on what is permissible. Unfortunately, it is not possible to provide a price list for memorials as these are quoted on an individual basis once we have obtained the best price from our various stone suppliers. If you have an idea of what you would like we are very happy to provide a no-obligation quote for your consideration. We will be happy to discuss the different types of stone available and in particular advise you as to costs, procedures and regulations of the Authorities presiding over particular burial grounds. Once you have decided on what type of memorial you would like there are various steps which have to be taken and these can sometimes take a considerable amount of time. We will send you a quotation setting out the type of stone, shape and inscription for you to approve. You will need to confirm your approval by signing one copy of the quote and returning it to us, together with a deposit (usually 50% of the cost). Once we have your confirmation we must apply for approval from the cemetery or churchyard authority. We cannot proceed with the memorial until this approval has been obtained. (Please note that this also applies to additional inscriptions on existing memorials). Please be aware that for a new memorial we cannot order the stone until approval has been received, and this can take 6-8 weeks. Once the stone is delivered the stone mason will commence work on the inscription. We will advise you once the memorial has been completed and will arrange for it to be fixed as soon as possible, weather and ground conditions permitting.